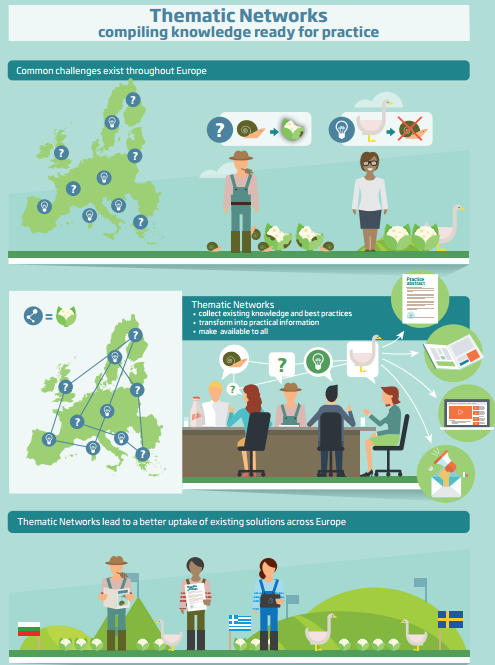 The agricultural European Innovation Partnership (EIP-AGRI) connects people and multi-actor projects to facilitate innovation and knowledge-exchange fostering competitive and sustainable farming and forestry. Join the EIP-AGRI network and promote your ideas and solutions that farmers can implement. If you have an idea for a Focus Group to spark innovation in agriculture and forestry, you can complete the form on this site. The European Innovation Partnership for Agricultural productivity and Sustainability (EIP-AGRI) was launched in 2012 by the European Commission (EC) (DG Agriculture and Rural Development) with the help of the EIP-AGRI Service Point (SP), to contribute to the European Union's strategy 'Europe 2020' for smart, sustainable and inclusive growth. Supports the networking functions, collects research needs from practice, provides information about needs for research from practice and about findings, and helps members around innovation project ideas, providing innovative solutions and giving inspiration to create ideas on their own. The European Union's (EU) strategy sets the strengthening of research and innovation as one of its five main objectives and supports a new interactive approach to innovation: European Innovation Partnerships (EIPs) launched in the context of the Innovation Union. With focus on agriculture, the EC provides guidance to Member States (regions) at the stage of programming and implementation on issues related to innovation and the EIP for Agricultural Productivity and Sustainability, and promotes all the information through the European Network for Rural Development (ENRD) hub that connects rural development stakeholders throughout the EU. Coordinating agricultural research across the European Research Area, the Standing Committee for Agricultural Research has engaged in assisting the EIP through the development of innovative Horizon 2020 instruments. It is providing advice via a dedicated working group on Agricultural Knowledge and Innovation Systems (AKIS). 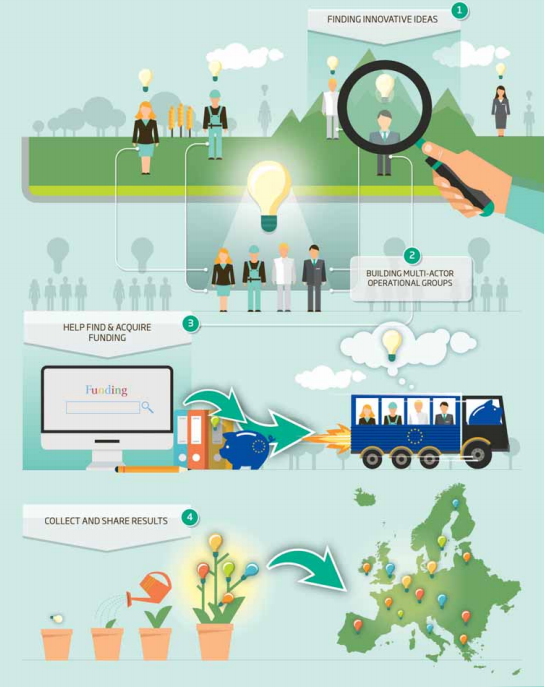 There are different types of funding available that can help get a project started, such as under the Rural Development programmes (RDPs, 2014-2020) or under the EU research and innovation programme Horizon 2020. The two policies complement each other: RDPs are normally applied within a specific programme region, and research policy must go beyond this scale by co-funding innovative actions at cross-border or EU-level. EU-backed small business loans (closing dates till 31 December, 2018) support entrepreneurs and businesses through a wide range of EU programmes via local financial institutions. Companies of any size or sector can benefit from this support. 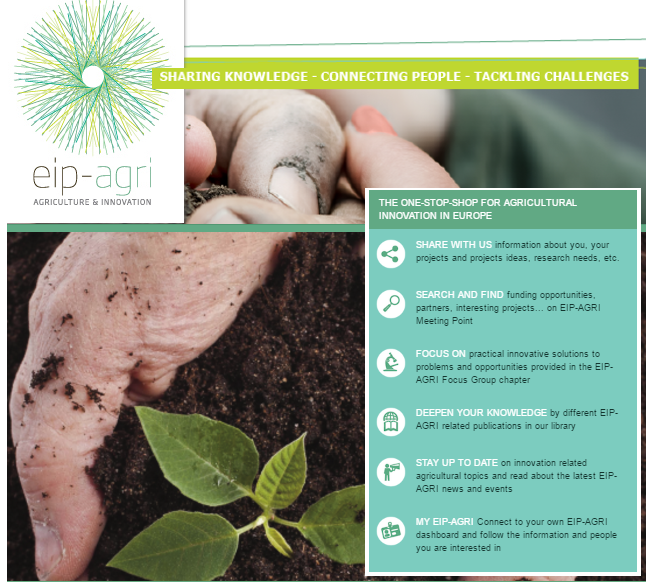 Through the EIP-AGRI website and Newsletter, EIP-AGRI will update members of the network on new funding opportunities and calls. To ensure a steady supply of food, feed and biomaterials, to contribute to the sustainable management of the essential natural resources (on which farming and forestry depend), as well as to help build bridges between research and practice, the EIP-AGRI brings together innovation actors (farmers, researchers, agribusinesses, farmers, advisers, NGOs, member states, businesses, public authorities and other actors within agriculture and forestry). These practitioners will be working together - through the EIP-AGRI network connecting EIP Operational Groups and multi-actor projects - to find solutions for specific issues or developing concrete opportunities (e.g., a new product, practice, service, production process or a new way of organizing things, etc.) that can be widely adopted and prove their usefulness in practice (view: Thematic Networks under Horizon 2020. Compiling knowledge ready for practice).. Together with the output from the networks funded by the 2016 and 2017 calls, the EIP-AGRI network will enrich the EIP-AGRI database with concrete solutions that farmers can easily implement. If you already know what kind of partners you would like or need, you are welcome to find them on the LinkedIn partner search platform. The success of the EIP depends on EIP-AGRI multipliers: people who share EIP-AGRI information in their own network. The EIP-AGRI will help spread all important new and existing knowledge on agricultural and forestry innovation beyond local or regional borders throughout the EU. The EIP-AGRI Service Point (SP) team facilitates the networking activities, enhancing communication, knowledge sharing and exchange through conferences, Focus Groups, workshops, seminars and publications. The Focus Group experts will be selected in September 2016. If you have an idea for an issue or question where a Focus Group could be the right tool to spark innovation, please complete the form on this site (the topic has to be very focused with a clearly defined main question). You can read more about how Focus Groups work and their expected results in the EIP-AGRI Focus Group charter and the Focus Group brochure. Contact servicepoint@eip-agri.eu if you would like to receive more information.